Historical fiction that includes a beautiful setting, a ghost, and Marilyn Monroe? Yes, please! The Beautiful Strangers is an easy-breezy read that is just what I needed while being bogged down by a bunch of nonfiction. This fictional take on Hotel del Coronado during the filming of Some Like It Hot is a nice escape read. I followed a young woman breaking free from the family mold to try something for herself - also on her grandfather's orders. 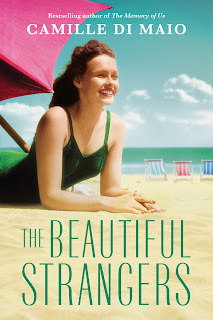 He wants her to find "the beautiful stranger" at this historic hotel. She lands a job at the hotel, impresses the right person quickly, and winds up being a waitress for the stars of the film. However, along with the pop culturish setting and characters, you also meet the ghost of the hotel and hear her story as it is interwoven between the chapters. There is a reason that she is intertwined with our main character - and while you may guess it early on, it does not take away from the reading experience. Add in some romance and you have a nice little read for spring break of summer vacation. Guess what else? This book is currently FREE on Kindle Unlimited or just $4.99 for regular Kindle subscribers. Thanks to the author and Netgalley for providing me with this copy to read and review.